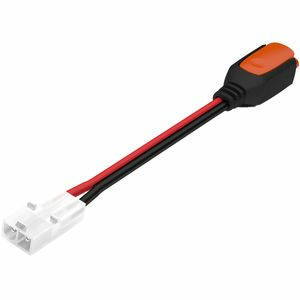 A great quality connection to upgrade your old motorcycle battery charger/optimate to the new CTEK connection standard. The new CTEK standard is also to be found on most new electric start ride on lawn-mowers/lawn tractors. So for the price of a pint, you don't need to replace your charger! An excellent way to connect your old battery charger to the New standard, CTEK plugs. A superior build quality, ensures that you get a fully moulded plug with larger conductor size. The CTEK plug also has the benefit of a captive, push release, to ensure a positive connection. I leave the standard (white) end permanently in the charger now, as that is the part that failed on my charger originally. Eventually, I may cut the white plug off, and solder the red and black cables directly, with some nice heat shrink to my battery charger lead. The CTEK is a far superior connection. Excellent service. After a small mistake of sending the wrong product their response was faultless. Apart from an apology they made telephone contact more than once to advice what they were going to do and delivered the correct product by next day delivery. Anyone can make a simple mistake, it’s what follows that counts. Would definitely buy from this company again - highly recommended.